Brings many enhancements to the MTurk Worker Dashboard. This will happen until the status detail pages from Worker become active for your account. Shows your projected earnings for today. Shows the total of all bonuses received today. What requesters you submitted work for today. How many HITs you submitted for each requester. How much you earned from each requester. Shows all percents to the fourth digit. 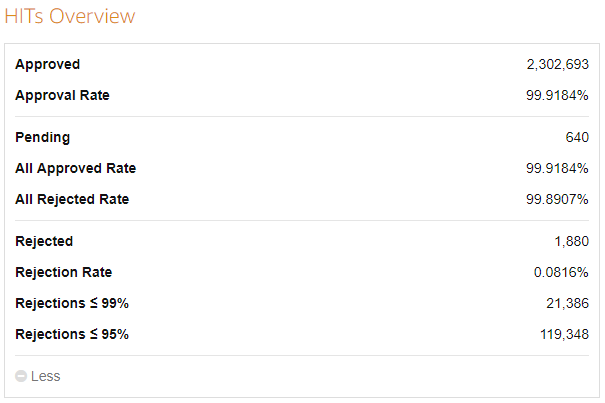 Shows your approval rate if all of your pending HITs get approved. Shows your approval rate if all of your pending HITs get rejected. Shows how many rejections it would take to bring you down to 99%. Shows how many rejections it would take to bring you down to 95%. A total for the last 45 days worked at the top. Shows any changes in the submitted, approved, rejected, pending and earnings columns.